A divided outcome, befitting a divided nation, came out of the 2018 midterms, with the House flipping Democratic, but the Senate staying Republican while voters were sharply split along partisan, ideological and demographic lines. 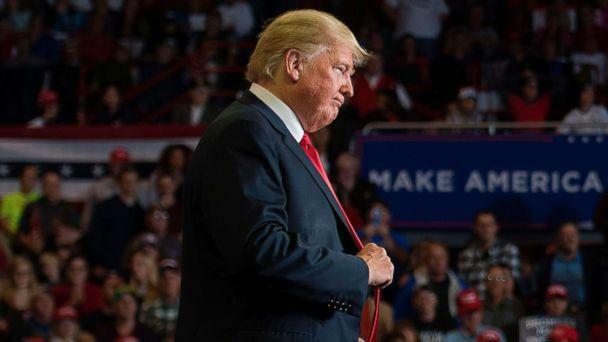 The focus of the election, President Donald Trump, came in where he’s been since taking office: underwater in job approval, 45-54 percent, with strong critics outnumbering strong supporters by a 15-point margin in the national ABC News exit poll. But Trump’s approval rating among voters was no worse than Barack Obama’s in the 2014 and 2010 midterms (44 percent both times). It could’ve been worse for a president whose average approval before his first midterm is the lowest on record. Voters said they were casting their ballots to show opposition rather than support for Trump, by a 12-point margin, 38 to 26 percent. A third of voters said Trump was not a factor -- and they voted Republican for the House by 52-44 percent, sapping some force from the "blue wave." The voters got what they wanted most: By 52-44 percent they preferred a Democratic rather than Republican-controlled House. And the Democrats flipped at least six governorships as well. • Women voted Democratic by 59-40 percent; men split 47-51 percent. That 23-point gender gap is the biggest in a national House vote in exit polls dating back to 1982 -- albeit by a single point. It was 22 points two years ago. • Whites voted Republican by 54-44 percent; nonwhites voted Democratic by 76-22 percent. Demonstrating the changing racial and ethnic face of the nation, nonwhites accounted for 28 percent of voters, highest ever for a midterm and 1 point from the record in any election, set in 2016. Consider the change: Nonwhites accounted for 9 percent of voters in the 1990 midterms. • Young voters didn’t appreciably increase their turnout, but their vote preference was the most Democratic on record -- 67-32 percent. Seniors, twice as prevalent, split 48-50 percent. • College-educated white women voted Democratic by 59-39 percent, by far the widest margin on record. Non-college white men voted Republican by 66-32 percent, a point from the widest gap in a midterm election, in 2014. • Evangelical white Protestants, 26 percent of voters, voted Republican by 75-22 percent. Everyone else voted Democratic by 66-32 percent. • Urban residents voted Democratic by 2-to-1, 65-32 percent; rural and small city residents voted Republican by 56-42 percent. And the suburbs, home to half of voters, split dead evenly, 49-49 percent. No wonder, perhaps, that 76 percent of voters said the country is becoming more divided politically. On that, ironically, there was majority agreement: 86 percent of Democrats, 67 percent of Republicans and 76 percent of independents shared this view. On the issues, health care prevailed, cited as the country’s top challenge by 41 percent, vs. 23 percent for immigration, 22 percent for the economy and 10 percent for gun policy. It sharply split the vote: Health care voters went Democratic by 75-23 percent; immigration voters were precisely the opposite; economy voters voted Republican by almost 2-to-1, 63-34 percent; and gun policy voters went Democratic by well over 2-to-1, 70-29 percent. On health care, concern over coverage for pre-existing conditions rang a bell for the Democrats; voters by 57-35 percent trusted them over the Republicans to handle it. On the economy, 68 percent said it’s in excellent or good shape, a dramatic turnaround from 2016, 2014 and 2010 -- but the impact at home was muted. Just 36 percent said their own finances have improved since Trump took office. As many said his trade policies have hurt their local economy as said they’ve helped, 29-25 percent. And it was a similar verdict on the Republican tax law: 29-22 percent, hurt-helped. There was other strong coffee for Trump and the GOP. 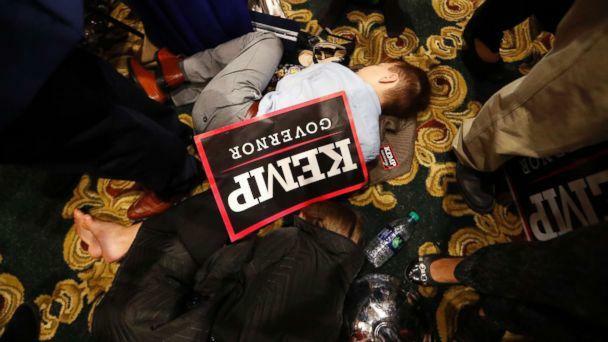 As good as the economy is nationally, 54 percent of voters said the country’s headed seriously on the wrong track. Many more said Trump’s immigration policies are too tough than about right, 46-33 percent -- though 17 percent said they’re not tough enough. And voters by 46-38 percent said Trump’s approach to foreign policy is making the country less safe, not more safe. That said, Trump took some wins, as well, notably at special counsel Robert Mueller’s expense. 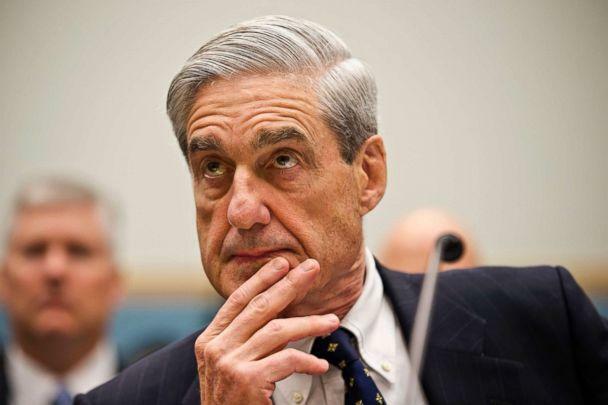 After months of Trump’s hammering, 54 percent thought the Russia investigation was politically motivated. Eighty-two percent of Republicans said so and 28 percent of Democrats agreed. A few other issues produced clear majorities. Voters by 66-25 percent said Roe v. Wade should be left “as is.” Fifty-nine percent favored stricter gun control measures. Seventy-eight percent called it important to elect more women to office; 72 percent said the same of racial and ethnic minorities. And 84 percent called sexual harassment a serious problem in this country. Yet there was far more disagreement than agreement in 2018 -- a highly likely omen for the 2020 presidential election ahead. All this -- and more -- played out differently state-by-state and race-by-race. With no winner Wednesday morning, exit poll results were chock-full of reasons why the Arizona Senate race was so close. Voters 65 and older split evenly: 50-50 percent between the Democrat Kyrsten Sinema and Republican Martha McSally. Sinema was helped by a 27-point margin among moderates (63-36 percent) -– the largest pro-Democratic candidate margin in an Arizona Senate race in available exit poll data back to 1994. Yet McSally struck back by winning the 44 percent who said Trump wasn’t a factor in their vote, 58-42 percent. Trump’s approval rating was 52 percent in Arizona -- higher than his 45 percent nationally -– and McSally won those votes, 88-11 percent. 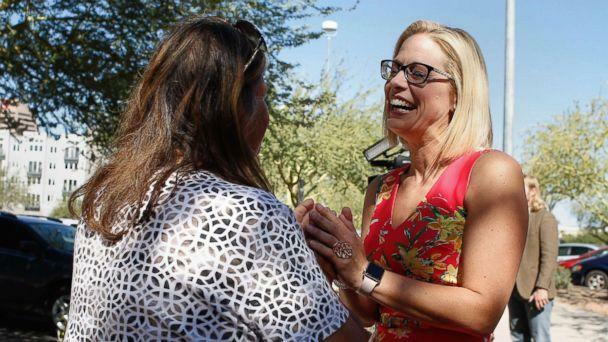 But Sinema held a narrow edge in Arizona’s giant Maricopa County, 52-47 percent. Shifts in vote preferences among key demographic groups denied any candidate an easy win. In the Senate race, again with no winner Wednesday morning, incumbent Democrat Bill Nelson’s +12 advantage in 2012 shrunk to naught as he failed to maintain his margins among Hispanics and suburban voters, and lost men. He won 76 percent of health care-focused voters, but that was offset by those more focused on immigration and the economy. Republican Rick Scott gained 6 points among Hispanics and 8 points among small city and rural voters from his 2014 gubernatorial election. He also got to run on the economy’s coattails: Two-thirds of Florida voters said the economy was excellent or good, and they favored him by 18 points. Still, that only brought them to an even 50-50. Similar patterns emerged in the governor’s race, though Democrat Andrew Gillum’s early concession brought the race to an end. Gillum, an avowed progressive, was seen as too liberal by 46 percent, while Republican Ron DeSantis -- a Trump devotee -- was deemed too conservative by 34 percent. DeSantis won the suburbs by 7 points and rural areas by a whopping 42 points, while Gillum won the 43 percent who live in urban areas by 14 points. Regionally, Gillum took the Miami and Gold Coast areas, by 31 points, but lost every other region of the state. He was also not able to open up more space among nonwhites, who voted similarly this year as in 2014, when Democrat Charlie Crist narrowly lost to Republican Rick Scott. In another still-unsettled race, Republican Brian Kemp was helped by a record 51-point margin among white voters in a Georgia gubernatorial race, 75-24 percent (albeit by +1 from 2014). Democrat Stacey Abrams benefited from record midterm turnout among nonwhite voters, 40 percent, as they overwhelmingly broke for her, 84-15 percent. Kemp won Georgia’s suburban voters by a wide margin, 57-42 percent -- suburban women (44-56 percent) and suburban men (40-58 percent) alike. Abrams won independents, 53-45 percent. Democrat Joe Donnelly lost his re-election bid in the third most-Republican state in this year’s exit polls (which were conducted in 21 states). His 12-point margin among women against a weak opponent in 2012 shrunk to just 2 points. He ran evenly among men six years ago, but lost them by 17 points this year. Donnelly even lost votes among urban voters in Indianapolis, going from a 34-point margin to 20 points. Trump and native son Mike Pence were popular here, 55 percent approval and 54 percent favorability, respectively. The Democratic strategy of promoting Libertarian Lucy Brenton may have backfired; she pulled away more liberals, 6 percent, vs. 4 percent of moderates and 2 percent of conservatives. 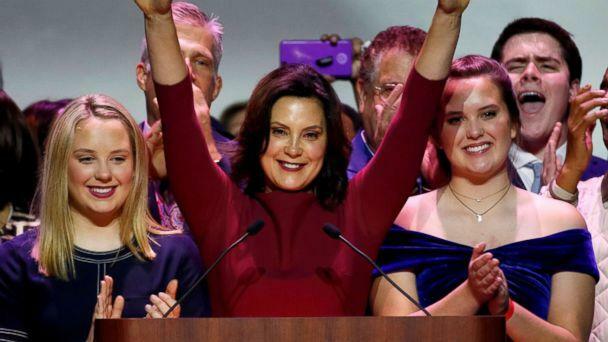 Women propelled Democrat Gretchen Whitmer to become the state’s second female governor. While Hillary Clinton lost white women by 8 points in Michigan in 2016, Whitmer won them by a 7-point margin, 53-46 percent. She also won independents by 5 points -– a group that backed Trump by 16 points in the state 2016. Voters were significantly more likely to say she was able to handle the issue of safe drinking water than Republican Bill Schuette, 56-31 percent. She also won big among the plurality of Michigan voters (44 percent) who named health care as the most important issue facing the country, 74-23 percent. Democrat Mike Espy and incumbent Republican Cindy Hyde-Smith are headed to a runoff after ending the multi-candidate night in a dead heat, 41-41 percent, with Republican Chris McDaniel taking a consequential 16 percent of the vote in the Mississippi special election. Though 65 percent of Trump approvers (59 percent of the electorate) voted for Hyde-Smith, a substantial 27 percent voted for McDaniel. He also won a quarter of Republicans and conservatives, keeping Hyde-Smith well below the majority threshold needed to avoid a runoff. For his part, Espy won four-in-10 independents, a new high for a Democrat in sporadic exit polls since 1984, though far short of the share he needed to swing the deeply red state. 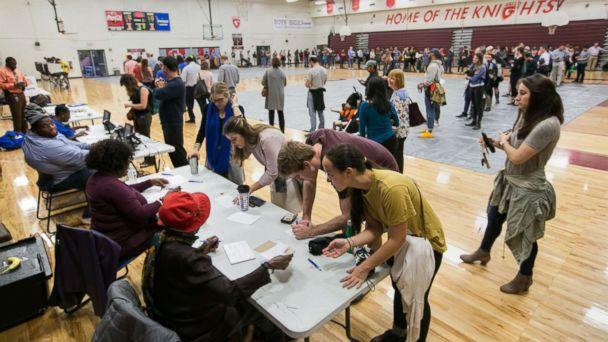 And at 33 percent, the turnout among blacks was a bit short of its 2012 level, 35 percent. In a test two-way matchup, voters split 41-53 percent between Espy and Hyde-Smith. Republican challenger Josh Hawley’s Senate victory relied on a large advantage in the suburbs, 57-42 percent, and an even bigger advantage in small cities and rural areas, 71-27 percent. Hawley won men by 15 points, 57-42 percent; in McCaskill’s last race she won men by 8 points. The healthy economy helped Hawley; 42 percent said they’re better off financially than two years ago, and they backed him 79-21 percent, McCaskill-Hawley. McCaskill won adults 18 to 44 years old, but their turnout -– 36 percent of Missouri voters –- wasn’t enough to hold her seat. The Montana Senate race was undecided by Wednesday morning, in part because voters preferred a Republican-controlled Senate by 50-42 percent, yet retained some affection for incumbent Democrat Jon Tester. Despite Trump’s multiple visits to the state, 54 percent -- more than anywhere else -- said Trump was not a factor in how they voted, and Tester won that group by 57-42 percent. His vote against Brett Kavanaugh may also have played a role; Rosendale won by 20 points among the 67 percent of voters who said it was a factor in their vote. Tester doubled his 2012 winning margin among women (58-39 percent) and quintupled his margin among voters under 30 years old (70-27 percent), though the exit poll indicated that he was essentially even with Rosendale among nonwhites, a group Tester carried by 42 points in his last victory. 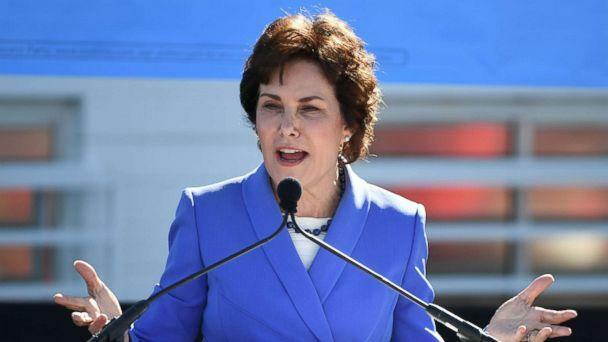 Democrat Jacky Rosen's victory came from women -- she won them by 21 points, 58-37 percent. Republican incumbent Dean Heller had held his losses among women to 6 points in 2012. Moreover, while Heller won independents by 20 points in 2012, he lost them this year by 22 points, 58-36 percent. Nonwhites accounted for 38 percent of Nevada voters, a record in midterms in the state, and Rosen won them by 68-28 percent. Rosen focused on health care, the top issue to 39 percent of voters, and won them by 79-18 percent. Only a minority of voters said Democrat incumbent Bob Menendez has high ethical standards (30 percent), and 64 percent rated him unfavorably. Yet he won in solidly blue New Jersey nonetheless, with help from the 51 percent of voters who were looking to flip the Senate. Menendez won big over Republican Bob Hugin among liberals (86-10 percent), but lost some ground among moderates, winning them by 14 points, down from 24 points in 2012. Democrat incumbent Heidi Heitkamp was unseated by Republican Kevin Cramer in a state where six in 10 voters approved of Trump –- second-highest across exit polls this year. 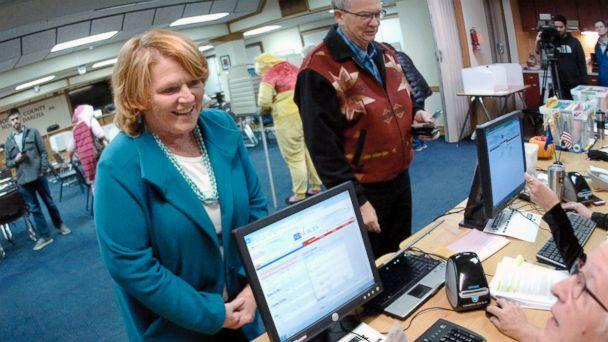 Heitkamp was seen as too liberal by 45 percent, while Cramer was seen as too conservative by fewer, 39 percent. Her vote against confirming Kavanaugh also played against her –- 42 percent said it was important in their vote and nearly two-thirds of them backed Cramer. Seventy-four percent of voters said the nation’s economy is in good shape –- up from 34 percent when Trump won the state in 2016 –- and these voters went for Republican Mike DeWine over Democrat Richard Cordray by 29 points, 64-35 percent. Ohio voters were relatively pro-Trump (52-47 percent) compared with the nation as a whole (45-54 percent); his approvers backed DeWine by 89-10 percent. DeWine won big among constituencies that lifted Trump to victory, including whites (+16 points), men (+20), rural residents (+30) and non-college white men (+38). Fifty-eight percent of Tennessee voters preferred Republican control of the Senate, helping to propel Republican Marsha Blackburn over Democrat Phil Bredesen. It was one of the top states to favor Republican control (alongside Mississippi and North Dakota.) Blackburn also benefitted from strong personal popularity, rated favorably by 55 percent vs. Bredesen’s 49 percent. While 37 percent said Blackburn’s views are too conservative, more said Bredesen’s are too liberal, 45 percent. Thirty-eight percent said they cast their vote to show support for Trump, vs. 24 percent voting to oppose him. 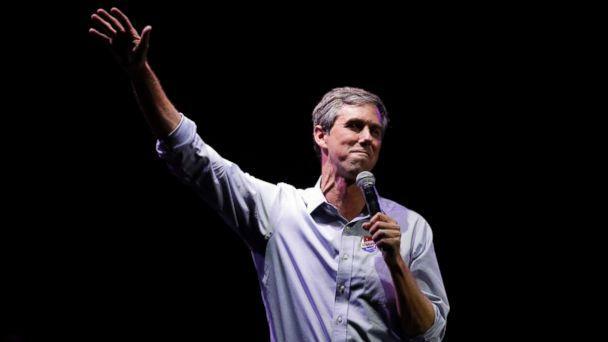 Record turnouts among nonwhites (44 percent) and Latinos (26 percent) in exit polls since 1984 weren’t enough to for Democrat Beto O'Rourke. Whites, 56 percent of the electorate, voted for incumbent Republican Ted Cruz by a broad 32-point margin, 66-34 percent. Men also kept the Republican stronghold red, voting for Cruz by 56-43 percent, compared women’s 8-point margin, 54-46 percent, for O’Rourke. Among the 61 percent of Texas voters who live in gun households, Cruz won by 63-36 percent. Lastly, dispelling myths that the growing out-of-state population is turning the state blue, native Texans split 51-48 percent, O’Rourke-Cruz, compared with a 15-point margin for Cruz among those who moved to the state. Democrat Joe Manchin won re-election in Trump’s best 2016 state -- despite the fact that Trump’s 63 percent job approval rating was highest here in the 21 states where exit polls were conducted. A plurality, 40 percent, said Trump was not a factor in their vote, and Manchin won them by 54-41 percent over Republican Patrick Morrisey. Manchin also benefited from higher personal popularity than Morrisey; 49 percent vs. 38 percent. Forty-one percent called health care the top issue (of four) in their vote, and they went for Manchin by 51 points. A 52-45 percent win among political independents enabled Democrat Tony Evers to unseat Republican Scott Walker. So did three-quarters support for Evers among nonwhites, whose 17 percent turnout was their largest in available Wisconsin midterm exit polls since 1994. (Walker won whites, 54-45 percent.) Forty-eight percent supported Walker’s signature 2011 law eliminating most collective bargaining for public employees, vs. 38 percent who opposed it. But it wasn’t enough to win Walker a third term. Patrick Moynihan and Laura Silver contributed to this report.